We had some windy spring showers last week and my gran found a perfect little bird’s nest that fell from one of the trees. 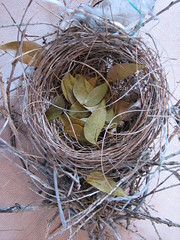 It is such a cleverly constructed little basket, the tiny twigs woven round and round. 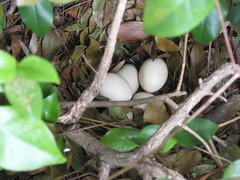 Yesterday, we had another nest-related surprise… the neighborhood hen has been making an awful fuss lately, cackling at all hours and terrifying the cats, turns out she’s been laying eggs. She belongs to someone who lives down the street, but she’s made herself a nice little nest among the trees behind our apartment. We hope the troublesome neighbor kids don’t notice that they’re there… or that the brave rooster gives them a good pecking if they get too close. 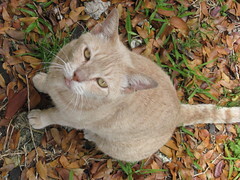 Crookshanks (below), Lola, and Kittygirl (the outdoor cat colony) are terribly frightened by the chickens because the feathered beasties scare them away and steal their kibble. After many failed attempts, we finally managed to get Crookshanks (one of our outdoor kitties) to go to the vet. A few months ago he developed this weird growth in his ear and, though it only looked like an infection at first, it turned into a nasty bloody mass rather quickly. Since he’s an outdoor cat, getting him into a carrier was a trial, and we ended up having to ask the vet for a sedative to calm him down before we could take him in for a visit. 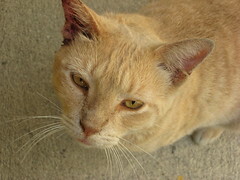 The test results came back and the vet says he has FIV (feline aids) in addition to the tumor in his ear. The lab tests for cancer haven’t returned yet, but they wanted me to decide whether they should put him to sleep because of the FIV, or proceed with the ear surgery and hope for the best. It was a tough decision to make under pressure, but I decided to let them go through with the surgery. I’ve read that cats can live for years with FIV and do just fine; and he’s such a young cat, I’m hopeful and think that he’ll recover once the tumor has been removed and he can eat without pain. He’s so sweet-tempered and silly, I didn’t think it right to euthanize him if he’s still strong and healthy. Aside from the ear, he’s fine. It’s just that the growth was so large that he could barely eat. With that gone, he should improve. Surgery went well, so he’s home now, but still sedated and very weak. I hate seeing him like that, unable to stand and move around — it reminds me of when Didymus was ill a few years ago, before we knew that he has diabetes and he was wasting away fast. The vet said the growth went deep into his ear, so they had to go inside to get it out. He’ll be in pain for a few days and we have to watch to make sure that he doesn’t remove his stitches if he scratches himself.